3d Modeling software or tool works as an integrated suite for modeling, rendering, animation, playback in games,interactive creation.On Ubuntu 10.04 there are so many 3d tools are available for editing and creating 3d models and animations but Blender,an open source 3d animation tool, is the most widely used software.Blender comes with its user interface(GUI) with rich set of features.Blender is implemented completely in OpenGL and it’s speed is also very good.you can easily import and export files in some popular formats like 3D studio and Wavefront Obj. 1. First,Go to Applications->Ubuntu Software Center and use the quick search bar to search for “blender“. 2. Next,click on more info if you are going to use it for first time(just to know more about the features of Blender) and then click on install Free(or click on install in search result window). 3. Downloading and installation process will finish consecutively within few minutes. 4. 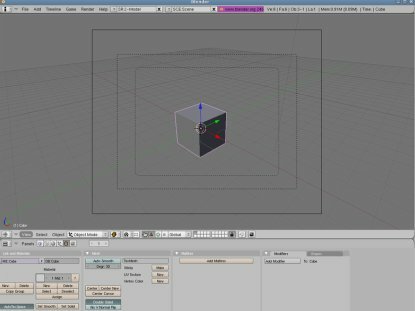 Now you are ready to use Blender for modeling or animations.Now Click on Applications->Graphics->Blender to access it. Conclusion : I hope you will enjoy modeling by using blender specially in developing models for game or other third party engines.You can also search for plugins on web to add some more feature to blender.